What are the goals of the sites where you syndicate your real estate listings? Do they profit if you profit? Or, do they profit by sending people away from your listing when they click on ads? One way to look at this is to count the number of ads that appear on listing detail pages of syndication partners. 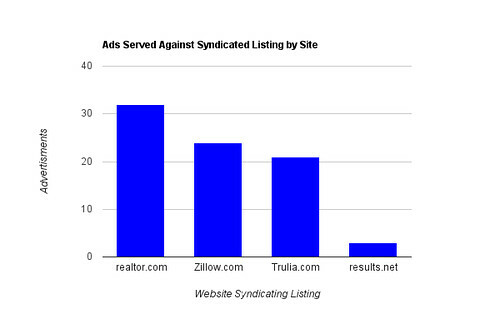 Below, I’ve tallied up the ads served against a listing on three major syndication sites: Realtor.com, Trulia, and Zillow, as well as the presentation of the same listing on a broker site. Ads for advertising on the website. I’ve highlighted the ads on each listing detail page below in yellow and added the tally below the image. As I run the numbers, I see three ads being served against a syndicated listing on a real estate broker’s website vs. 21-32 ads on major national syndication sites. While a broker could serve ads against listings, a broker will generally make more money by earning leads than sending people away from their sites through ads. Consider thinking about it this way: If 100 people visited your listing on a broker’s website vs. visiting the same listing on syndication sites that profits from advertising, what percentage of visitors would convert to leads for you rather than leave through one of the many advertisements? Syndication isn’t necessarily good or bad. And, not all syndication is the same. We syndicate listings for some of our clients. Others do it through their MLS. And others do not syndicate. The point here is to research whether your listings are being used as advertising bait or to help you generate leads.